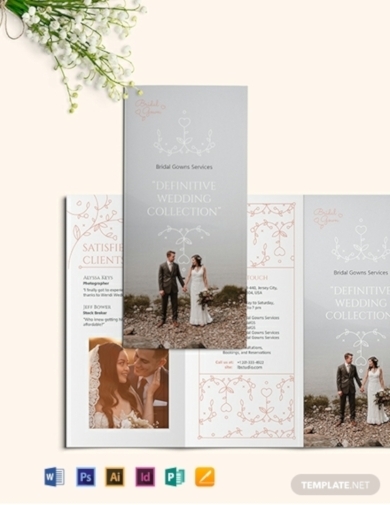 A design brochure, such as a wedding brochure, can be used for various purposes. 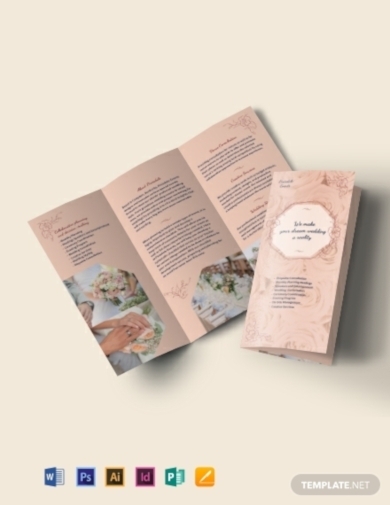 For couples, wedding brochures can serve both as an invitation or program guide where they can both inform their guests the details for their upcoming wedding and can serve as a souvenir that their guests can keep as a keepsake for the wedding. For wedding vendors, or those whom you pay for products or services for a wedding event, it is through wedding brochures that they can list down the products and services they can offer for a wedding. 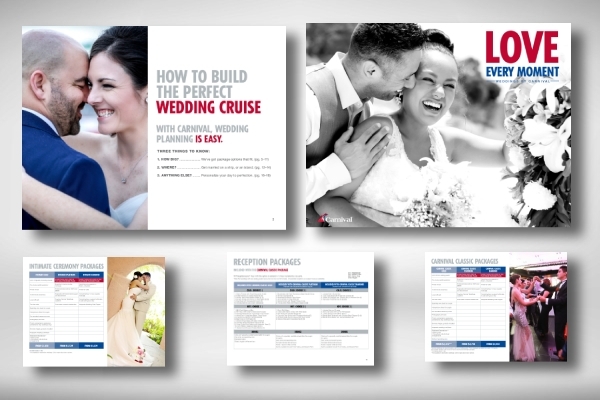 Whatever your purpose are for looking for a wedding brochure, we have already you covered because in this article, we offer the best of worlds for we have provided wedding brochure examples and templates that you can use for your own wedding and for your business. Are you looking for a wedding brochure where you can conveniently layout all of your offers and services as a wedding event planner? Here is a wedding event planner trifold template just for you. 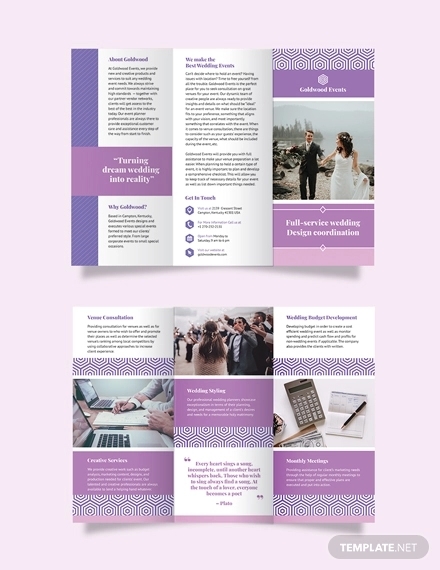 Aside from being an effective medium where you can easily discuss what you can offer to your potential clients, this template also contains amazing graphic design elements and efficient layout that are not only attractive to the eyes of your clients but it can also captivate the hearts of your clients! 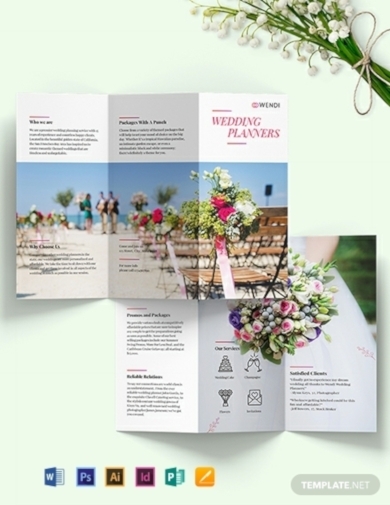 If you are looking for ways on how you can boost your marketing efforts and other promotions of your wedding services to your target market, then making use of this wedding planner trifold brochure will be a wise choice and move. 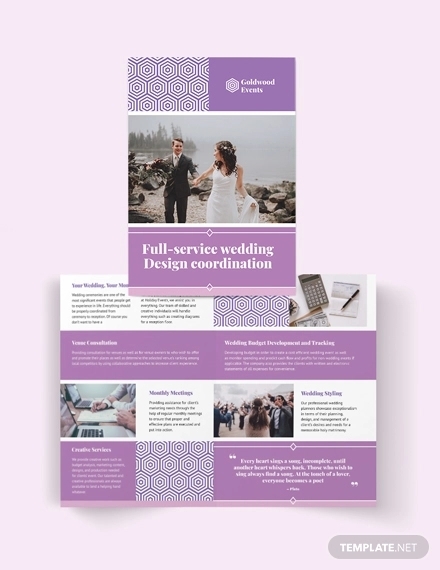 Through this template, you can easily highlight your wedding services and packages that comes along with an insightful content and quality graphic elements that can further enhance the overall appearance and quality of your brochure. 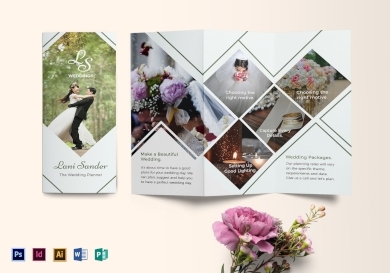 Get creative in advertising and marketing your wedding-related business with the use of this wedding planner trifold brochure! This brochure template includes a large space where you can include a large photo where you can conveniently display what your business can offer without having to compromise the space for any written content. What’s great about this template is that you can easily customize and edit this using various editing software applications such as the Adobe Creative Suite and Microsoft Office Suite. 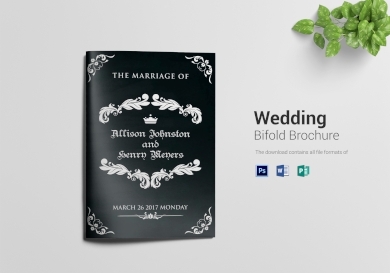 Captivate your guests’ attention by giving them this beautiful black wedding bifold brochure template as an invitation to your upcoming event. Unlike traditional wedding invitations, this kind of invitation provides a different take with its unconventional colors and typography and it also provides a minimalist look and feel to the usually crowded layout of most wedding invitations. If this is the design you are aiming for, then look no further and download this template now. 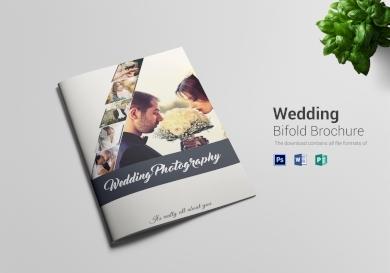 Allow couples to conveniently browse and choose from your wedding photography services by giving out this exquisitely designed wedding photography brochure. Through this layout, you can also easily incorporate some of the high-quality photos that you have taken from your previous projects or transactions as well as some catchy headings and subheadings that are used with captivating typography. Without the assistance of wedding planners, wedding ceremonies and wedding receptions would be chaotic; however, not every couple is aware of this fact. If you are a wedding planner and you want to prove that enlisting help from wedding planners like you is the next best thing your clients should do, then you should make use of this wedding planner brochure template. Through this template, you can easily list down all of your services and even the benefits that people can get from booking you as their wedding planner. 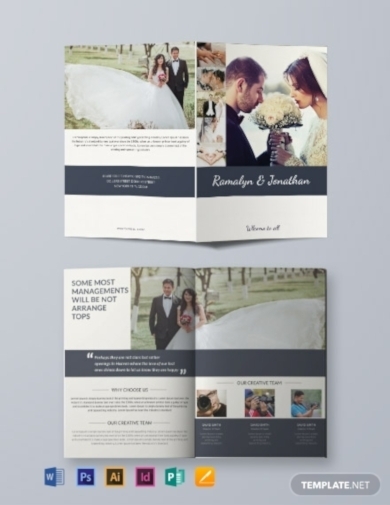 Invite your guests by sending them this wedding bifold brochure instead of just simply sending them a wedding invitation card. The best thing about this template is that you can get as creative as you can since it also comes in a customizable layout that you can conveniently modify using various creative document editing software programs such as Adobe InDesign and Microsoft Publisher. Hand out this elegant and wonderful bifold brochure to your guests that doubles as an invitation to your upcoming wedding event. 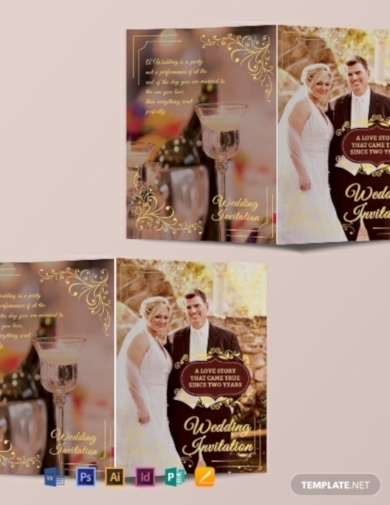 Although you can always opt for a wedding invitation card since it is way less bulky compared to a brochure, providing a wedding brochure is also a way of giving your guests a souvenir of one of the momentous day of your life. You can incorporate additional miscellaneous but creative pages where they can paste the photos from the wedding to make it more personalized on their end. When creating a wedding brochure where you can list the wedding services you can offer to your clients, merely listing them down just as it is will not be convincing enough. To effectively persuade your target clients, make sure that you will be able to incorporate a myriad of high-quality photos, similar to this given example. It is best if the images you incorporate are specifically the photos of your previous projects or transactions so you can confidently show what you have offered to your previous clients and confidently prove that you can offer the same services again and if not, better. 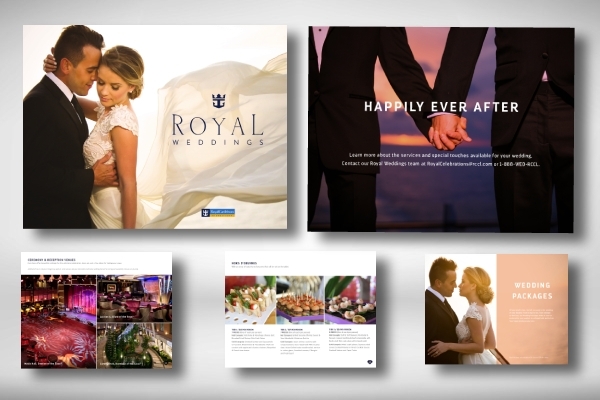 Similar to the previously given example, this wedding brochure example also made use of the power of images. By incorporating high-quality images in your wedding brochure design that displays your previous work s or performances, you gain the trust of your potential clients, which means that they trust your skills and capability of delivering and providing excellent wedding services to all of your clients.